Adams Concert Series Synthetic Marimbas are constructed using Adams specially designed Synthetic bars. These bars are designed specifically for both outdoor and indoor use to suit all of your performing needs.Adams New Synthetic bars offer a warm sound, superior projection, and unmatched durability to the sun and heat of outdoor performances. 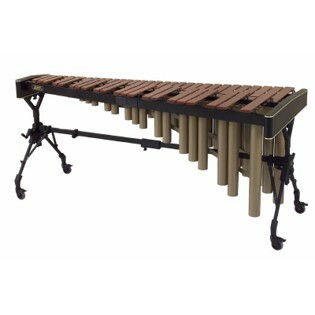 These bars are full-size and graduated and constructed with the same precise tuning and voicing as the Artist Marimbas. Tuned through the sixth overtone, all Adams bars offer complete control over all aspects of the marimba sound. Precise tuning and voicing provides for a balanced sound through the entire range of the instrument. Resonators are welded, not riveted, and offer the utmost strength and safety from mechanical noise. Both the Voyager and the Field Frame allow for effortless adjustment to a wide range of playing heights. Covers and Mallets included. Ht Adj: 33.4" - 41.3"